Washington Square Press, 9780743411486, 320pp. Here is the chronicle of the strange events that befall Mandragora, a primitive farming village in the Outer Hebrides. A tale of conflict where there had been none, of lives irrevocably transformed, this is the written testimony of farmer and inventor Yves Gundron, edited and annotated by Harvard academic Ruth Blum. Yet this historical manuscript is not quite what it seems...and neither is the town of Mandragora. When Yves recalls lyrics that are recognizably from a blues song, it begins to seem that Blum is not merely an anthropologist preparing a historical document, but an active participant in Mandragora's battle with the double-edged sword of progress. 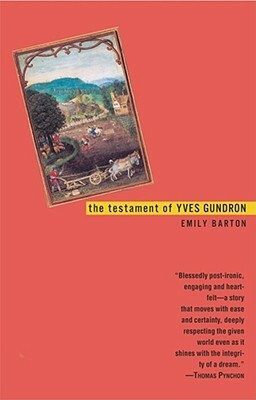 The Testament Of Yves Gundron is a brilliantly imagined exploration of the pursuit of modernity -- and of the detritus left along the way. Emily Barton graduated from Harvard and the Iowa Writers' Workshop. She lives in Brooklyn.